The documentation with this disc states that it was made sometime in 2009, but the somewhat one-dimensional quality of this analogue recording seems to look back to an altogether earlier age in recording technology. 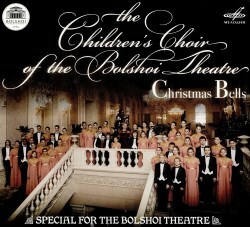 And the fact that the CD is designed to look like an old Melodiya LP (complete with the 33 rpm insignia), and is closer to the playing time of a full LP than a full CD, adds to the sense that this is something of a blast from the past; although its unashamed focus on music of the western Christmas tradition belongs very much to post-Soviet Russia. The principal work here is Britten’s A Ceremony of Carols. Recording limitations aside, this is a splendidly vigorous and vital performance which magnificently matches the energy of Britten’s writing. That this very large children’s choir – individual singers are not named, but a photograph shows over 50 children in the line-up - has strong connections with the ballet is evident from the fleet-footed way they dance around the athletic “This Little Babe”, confidently enunciating their English words with an ease of delivery which would be the envy of a choir half the size and twice the age. Yulia Molchanova exercises tight control over her musical charges and draws from them a very open and vigorous sound which, for all its obvious discipline, has that wonderful freshness which is unique to enthusiastic children singing. Maria Krushevskaya’s harp has a pleasing gentleness and discretion to it, which ideally complements the unfettered vitality of the singing. The remainder of the disc is given over to a motley selection of short songs, not all of which seem immediately relevant to Christmas, but all of which are delivered with the same combination of enthusiasm and tight choral discipline. Intriguing arrangements (uncredited in the booklet) of Ding! Dong! Merrily on High, Jingle Bells and We Wish you a Merry Christmas give the choir a wonderful opportunity to have fun, aided and abetted by some sparkling piano accompaniments from Margarita Petrosian. More reflective moments come with delicately poised accounts of Stille Nacht and Linda Spevacek’s gently swaying Sing a Joyous Alleluia. The presence of two principal singers from the Bolshoi Opera adds considerable distinction to the disc. Maksim Paster offers up a beautifully elegant account of Panis Angelicus simply oozing with pious sincerity, while his boisterous delivery of Funiculi, Funiculà is almost more idiomatic than a true native Neapolitan tenor – and the crisp interjections from the children’s choir add a wonderful touch of youthful vigour to this most buoyant of songs. Anna Aglatova’s voice has a deliciously ethereal quality in the Mozart Alleluia, and she presents such a sumptuously lyrical interpretation of Vavilov’s Ave Maria that one cannot help but think of Rachmaninov’s Vocalise. The booklet notes point out that this setting of the Ave Maria was for many years thought to be the work of an Italian composer of the 17th century. Only the relaxation on Russian composers producing music for the Christian Church allowed Vavilov’s work to be properly recognised.